Well, hello! Long time no see, eh? I closed up shop for a while so I could make a cross-country move to Colorado, where I got a new job. I love it here, but miss my old avian pals from the backyard of birding dreams. There are a ton of new bird species out here, and they surely need pants, but my back yard is sparse and only has a fresh new tree. My HOA only allows “one bird or squirrel feeder” which is disappointing, but then again, I just need to go out to one of the millions of trails nearby and do some birding. And while the HOA is a bit of a bummer, I can’t say I don’t hate the tidiness of the whole place, and their “no wind chimes” rule makes me pretty happy, too. I sound like a curmudgeon, but it gets damn windy out here (they call ’em “chinooks”) so windchimes might be an issue. Meeting people has been somewhat slow, so I checked out some “meetup” groups, and am intrigued by “birding and beers” which is a group that goes birdwatching, then, unsurprisingly, goes to drink beer! I haven’t dived in yet, but will let you know how it goes. Things otherwise are great, Friendly people, lots of sunshine, and an impending puppy. I promised my fella a puppy since he was moving so far from home to let me pursue a great job. He was pretty happy about the move, I suppose, but now that there’s a puppy in it for him, he’s sold. There are several kinds of jays here, including a Gray Jay, which is referred to as a “camp robber” for its boldness. Stellar’s jays are also beautiful. 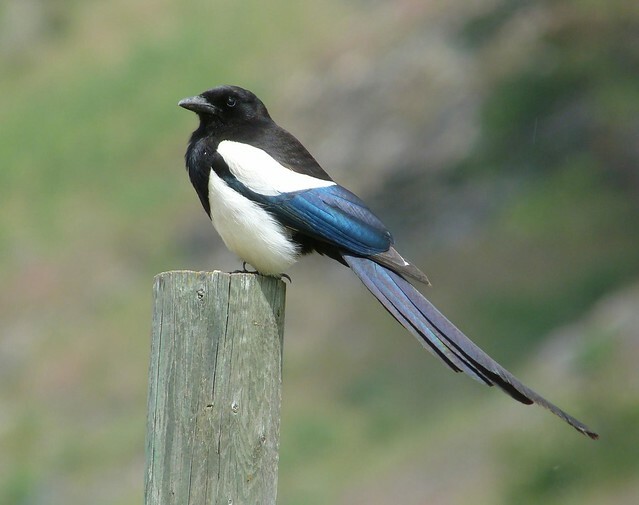 There are yellow-headed blackbirds and black-billed magpies. There are even pelicans!! I couldn’t believe that, but it’s true. All shall have pants soon. I imagine a pelican carrying a bindle for some reason. The Hermit Thrush’s beautiful, haunting song begins with a sustained whistle and ends with softer, echo-like tones, described asoh, holy holy, ah, purity purity eeh, sweetly sweetly. It pauses between each phrase, and the song is about 1.5 seconds long. Hermit Thrushes also deliver an extremely faint “whisper song” in spring. He’s quite elusive – we can hear him but not see him, so pants will be an issue. But I’ll try. Stay tuned for more riveting news from Colorado! I have my etsy shop up and running again, with a few items listed as I unpack them. Yay!